In 2002, he was featured in Eminem's debut film, 8 Mile. He was nominated for Independent Spirit Award for Best Actor for his role in Brother to Brother. His second nomination was for Best Supporting Actor at the 2009 Independent Spirit Awards for his role in The Hurt Locker. In 2014, he joined the Marvel Cinematic Universe as Sam Wilson / Falcon, making his first appearance in Captain America: The Winter Soldier, and reprising the role in Avengers: Age of Ultron, Ant-Man, and Captain America: Civil War. In May 2016, he co-starred in the HBO TV film All the Way as Martin Luther King Jr., opposite Bryan Cranston, who was reprising his Tony Award-winning performance as President Lyndon B. Johnson in the play of the same name. Mackie was born in New Orleans, Louisiana, the son of Martha (née Gordon) and Willie Mackie, Sr., a carpenter who owned a roofing business, Mackie Roofing. He attended Warren Easton Sr. High School and the New Orleans Center for Creative Arts (NOCCA) and graduated from the high school drama program at the North Carolina School of the Arts (NCSA) in 1997. He later graduated from the Juilliard School's Drama Division as a member of Group 30 (1997–2001), which also included actors Tracie Thoms and Lee Pace. In 2002, Mackie worked as an understudy to Don Cheadle in Suzan-Lori Parks' play Topdog/Underdog and won an OBIE Award for his role in Carl Hancock Rux's play Talk. His first starring role in a feature film was in the 2003 independent film Brother to Brother, where he played Perry, a young African-American artist who struggles to adjust to the world as a black homosexual. He appeared in the 2002 film 8 Mile, as Papa Doc, Eminem's nemesis. Mackie would later go on to star as a man who struggles to adjust to the world he's created after becoming a corporate whistleblower and later starting a business impregnating lesbians for a fee in Spike Lee's 2004 film She Hate Me. Mackie appeared in 2004 Academy Award winner, Million Dollar Baby, and five years later appeared in another Academy Award winning film, The Hurt Locker (2009). In 2006, Mackie starred in Half Nelson alongside Ryan Gosling and Shareeka Epps as well as We Are Marshall. In March 2008, Mackie starred in three plays by playwright August Wilson at the John F. Kennedy Center for the Performing Arts in Washington DC: Ma Rainey's Black Bottom, Fences, and Jitney – all part of "August Wilson's 20th Century", a month-long presentation of ten staged readings of Wilson's "Century Cycle". Mackie has participated several times in the "24-Hour Plays" held in New York City each fall. 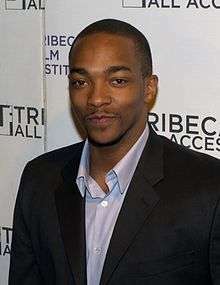 Mackie portrayed the rapper Tupac Shakur in the 2009 film Notorious. He first played Shakur on Off-Off Broadway (while still at Juilliard) in 2001 in the play Up Against the Wind, which also featured his classmate Thoms. Other films in the works include biopics of Olympian Jesse Owens, Antebellum slave revolt leader Nat Turner, and cornetist and jazz musician Buddy Bolden. In the summer of 2009, he played the role of Pentheus in the New York City Public Theater's Shakespeare in the Park production of The Bacchae. He starred with Christopher Walken in A Behanding in Spokane on Broadway, which opened February 15, 2010. Mackie also narrated The Best That Never Was, director Jonathan Hock's documentary for the ESPN 30 for 30 series about the Philadelphia, MS native and football star Marcus Dupree. He appeared in the 2011 Matt Damon film The Adjustment Bureau where he plays Harry Mitchell, a sympathetic member of a shadowy supernatural group that controls human destiny. Mackie co-starred, as the Falcon, in the Marvel Studios sequel Captain America: The Winter Soldier (2014). He reprised the role in 2015's Avengers: Age of Ultron and Ant-Man, and again in 2016's Captain America: Civil War. On June 30, 2015, Anthony Mackie was cast as Martin Luther King Jr. in the HBO TV drama All the Way. Mackie appears opposite Bryan Cranston (six-time Emmy Award-winner for Breaking Bad, and 2015 Best Actor Academy Award-nominee for Trumbo). Cranston repeats his Tony Award-winning role as LBJ in the play of the same name in this telefilm, which debuted on HBO on May 21, 2016. Mackie and his longtime girlfriend, Sheletta Chapital (born in 1978), married in December 2014. They have three children together. He opened a bar called NoBar in Brooklyn, New York in the summer of 2011. Mackie at the 2010 Tribeca Film Festival. ↑ Mandell, Jonathan (February 23, 2003). "SPRING THEATER: PERFORMANCE; Class Clown Makes Good, Quietly". The New York Times. Retrieved March 30, 2013. ↑ Louie, Rebecca (6 August 2006). "Anthony Mackie goes full tilt in 'Half Nelson'". NY Daily News. Retrieved 12 January 2016. ↑ Gajewski, Josh (December 22, 2006). "Up & Comers: Meet Anthony Mackie". Bangor Daily News. p. 12. Retrieved March 30, 2013. ↑ Maxwell, Erin; Jones, Michael (December 2, 2008). "Film trio feel the Spirit". Variety. ↑ "Anthony Mackie – Overview". Allmovie. Archived from the original on June 11, 2009. Retrieved June 21, 2009. ↑ "April 2006 Obituaries Orleans Parish Louisiana". USGenWeb Archives. Retrieved March 30, 2013. ↑ "Anthony Mackie". TV Guide. Retrieved September 2, 2010. ↑ Preiser, Amy. "Interview With Anthony Mackie, Bar Owner, Actor, DIY Enthusiast". Homesessive. Retrieved March 20, 2013. ↑ "UNCSA Alumni Nominated for Tony Awards". University of North Carolina School of the Arts. 4 May 2010. Retrieved 12 January 2016. ↑ Pedlow, Amelia (April 2010). "Q&A With Anthony Mackie". The Juilliard School. Retrieved March 30, 2013. ↑ "Alumni News for May 2008". The Juilliard Journal. May 2008. Retrieved March 30, 2013. ↑ "Anthony Mackie". Internet Broadway Database. Retrieved 29 February 2012. ↑ Itzkoff, Dave (July 6, 2009). "Anthony Mackie Joins the Bacchae". New York Times. Artsbeat. ↑ Graser, Marc (2012-07-16). "Mackie mulls Falcon in 'Captain America'". Variety. Retrieved 2012-07-17. ↑ Obenson, Tambay A. (September 13, 2012). "Anthony Mackie Confirmed To Play Falcon In 'Captain America' Sequel". IndieWire. Retrieved March 30, 2013. ↑ Lussier, Germain (February 24, 2015). "The Gang's All Here in the Official 'Avengers: Age of Ultron' Poster". /Film. Archived from the original on February 24, 2015. Retrieved February 24, 2015. ↑ Fleming Jr, Mike (November 14, 2014). "Daniel Bruhl To Play Villain In 'Captain America: Civil War'". Deadline.com. Archived from the original on November 14, 2014. Retrieved October 30, 2014. ↑ Fleming, Mike (June 30, 2015). 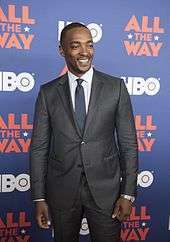 "Anthony Mackie To Play MLK Opposite Bryan's Cranston's LBJ In HBO's 'All The Way'". Deadline.com. ↑ Mathias, Christopher (July 20, 2011). "Anthony Mackie Opens Up 'NoBar' In Bed-Stuy, Brooklyn". The Huffington Post. ↑ "Calvin Mackie, Ph.D". channelzro.com. Retrieved March 30, 2013. and who now works at the Louisiana Recovery Authority. 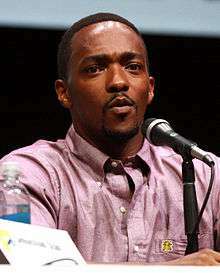 Wikimedia Commons has media related to Anthony Mackie.